Dallas winters can be a beast when it comes to how it can impact several aspects of our daily lives, especially with keeping your car wrap fresh. From simply warming up our hands to having to scrape ice off of the windshield every morning before work, the winter weather can be an inconvenience. The inconvenience rises when you take into account that now your car wrap job is susceptible to the damages that snow and ice brings to a vehicle. Many owners know that ice, snow, and salt cause rust and corrosion in the average vehicle’s exterior paint job, but not many know how to properly car for a vehicle that has been recently wrapped. Here are some basic tips that will help you to protect your car wrap during the winter. Even though using a scraper to get ice off of a car seems like a normal solution to ice, but it is murder on your wrap job. An ice scraper will most definitely scratch the vinyl of your vehicle wrap. This can also lead to the wrap peeling off, especially if your graphics extend to your windows. 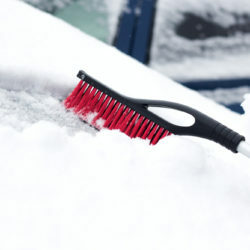 Put down the scraper and use a brush with soft bristles to get the snow off of the body of your car. Also, don’t let snow rest overnight on your car and turn into ice. Ice is extremely difficult to remove from a wrap, and doing so may cause scraping or other unwanted, permanent damage to the vinyl. Salt is a material that is frequently used to melt the snow off of the streets and prevent cars from skidding. However, this can be harmful to your vehicle, even without a vinyl wrap. Constant exposure to salt can cause both vinyl and paint to corrode. Aside from the danger of corrosion, salt can also discolor your vinyl car wrap and ruin the design that you selected. The best way to maintain your vehicle wrap during the winter is by frequently cleaning your car wrap Even though it may seem difficult to even think about hanging out in the cold weather and making sure that your car is cared for, we recommend washes at least every two weeks. If you fail to clean your car during winter weather, your wrapping runs the risk of being permanently damaged by snow and dirt that has accumulated during your travels. Any More Questions? Call SkinzWraps! If you are the owner of a gorgeous vehicle wrap job, then you surely want to make the cost and effort count. Don’t let the impending cold weather put a damper on the pride you have in your wrap. Give us a call today if you have any further questions about how to properly maintain a vehicle wrap during the winter.